Nine Girls Ask? 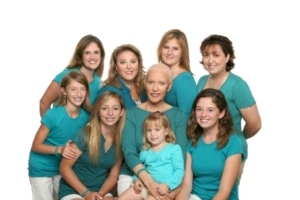 for a cure for Ovarian Cancer believes the gift of giving is an honor. It gives hope to woman who are not only experiencing their journey after being newly diagnosed with Ovarian Cancer, but in addition, to those women who continue to struggle with the challenging battle of recurrence. To make a donation, please complete the form below and click the Donate button, or send a check to our P.O. Box. NGA is a 501(c)3 Non Profit Organization. We take pride in the fact that we accomplish our goals with the assistance of volunteers supporting our mission. The Board of Directors along with the members of NGA do not accept salaries of any type and all funds are directed solely to Ovarian Cancer Research, Raising Awareness and offering One on One Patient Outreach. We deeply appreciate both corporate and private sponsors and support. We thank you in advance on behalf of all survivors. Your Tax Deductible Contribution Will Help Us Reach Our Goals! Please consider your cancelled check, or your receipt for credit card charge contributions made via internet, as your receipt for tax purposes. Thank you! "On behalf of myself, all members of Nine Girls Ask? for a cure for Ovarian Cancer, and all women who have been affected by this disease, we thank you with all of our hearts for your very generous contribution!"